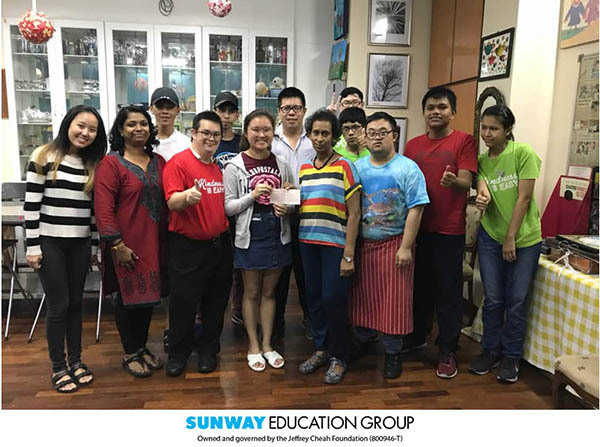 Students undertaking the Diploma in Events Management (DEMT Jan & Aug 2016 intake), School of Hospitality, Sunway University, recently held a successful charity campaign, with proceeds amounting to more than RM3500 benefiting an NGO, called GOLD. GOLD, an acronym for Generating Opportunities for Learning Disabled, aims to promote economic empowerment for those with learning disabilities, which may affect the acquisition, organisation, retention, understanding, or use of verbal or nonverbal information. Examples of Learning or Intellectual Disabilities include Down Syndrome, Autism, Dyslexia, and Minimal Brain Injury Dysfuntion or Attention Deficit Hyperactivity Disorder (ADHD). The members of GOLD consist of young adults with learning disabilities who have finished school, but do not know what their future holds. Therefore, GOLD aims to enable these members to maximise their potential and make them as contributing members to the Society, from being irrelevant to relevant, as well as from being tolerated to being embraced. The programs conducted by the NGO will equip the young adults with skills that will sustain them through life. 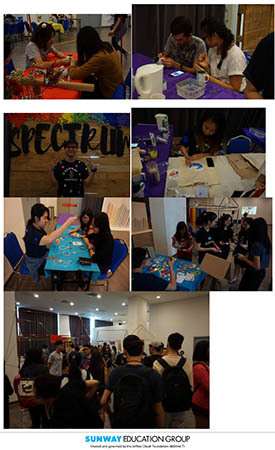 Understanding the need to be equipped with the right skills and attributes towards a successful working life in the future, the DEMT students decided that the charity campaign they are organising will be called ‘SPECTRUM: Colour Your Life’ to bring awareness and empathy to this NGO, which is housed in 3C Complex in Bandar Sunway. In addition to this, as one of the students’ brother is a learning disabled, the need to help the members of GOLD is even more vital and significant. 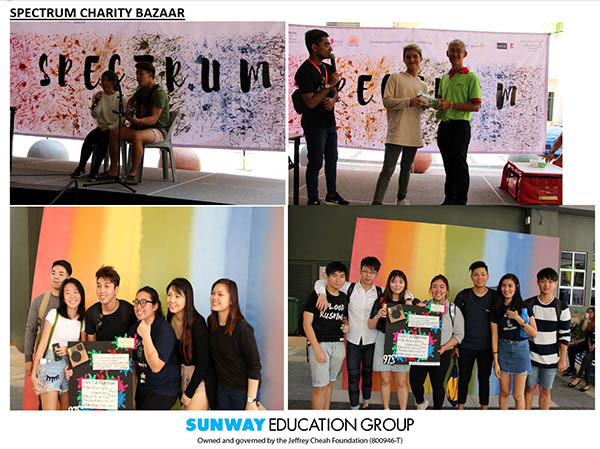 The campaign was divided into two parts, the first being a Charity Bazaar in Sunway College Boulevard, with more than 21 vendors taking part, inclusive of 2 food trucks, selling items from food and beverage, clothes, toys, shoes, accessories and others. Main sponsor, TagAMeal, made the event more vibrant through free giveaways of lunchboxes, and hotel vouchers, after performances of songs by various invited artistes. 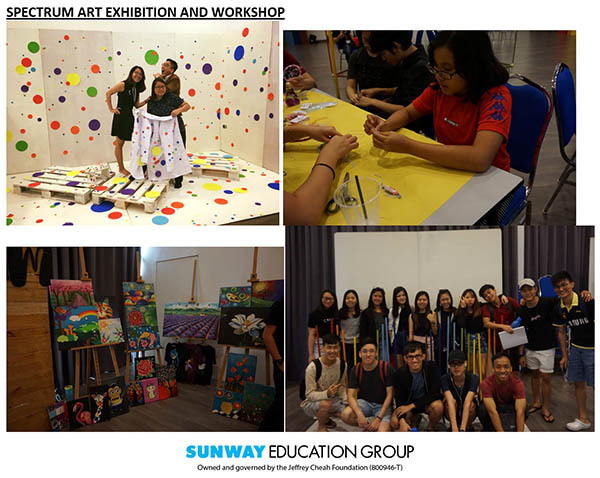 encouraged to register for various DIY workshops, which include making their own dreamcatcher, slime, flower bulbs, flower wraps, nail polished mugs, painted tote bags and T-shirts. In addition to those, there were various colourful photo booths for visitors to take pictures, and donate proceeds to GOLD. 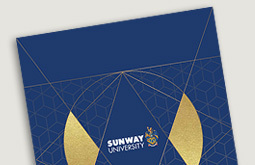 Their subject lecturer, Ms Belinda Fong commented that though the students went through sleepless nights, it was a rewarding experience for the students. 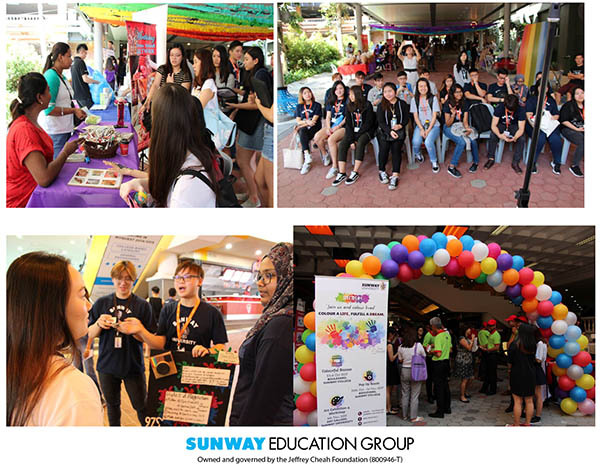 “I am especially proud of them as they made all the structures, photo-booth backdrops, decorations and art platforms on their own in an effort to minimise their budget, while trying to keep true to their objective in providing participants with an unforgettable experience,” she added. The execution of this event is a course requirement towards the subject, Events Operations II, where students learn practical skills in organising and managing events. As a follow-up to Events Operations I, this subject, Events Operations II emphasizes on managing, staging and evaluating events, and provides a practical platform for students to learn to be critical and creative in managing events, obtain sponsorships, create promotional materials, as well as handle media relations and marketing strategies. Professor Marcus Stephenson, Dean of the School of Hospitality, commented: “There are many challenges people face in terms of learning. 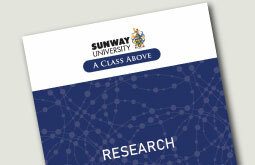 As a School and as a university we want to try to make a contribution. This is also a motivating factor for our students in their learning too, especially as they can understand how events such as this work and at the same time respect that an initiative like this serves the purpose of supporting a particular cause.  Community engagement and social responsibility are crucial components in what we do”.